Xinergy CEO Bernie Mason, drawing from his 35 year coal industry experience, runs the company from its Knoxville, Tennessee headquarters. 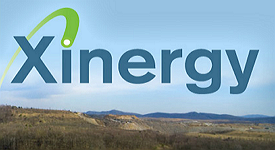 Xinergy’s revenue comes from operation of two major productive assets; the South Fork Mid-vol mine in Greenbrier, WV and the Raven Crest/Brier Creek thermal complex in Boone, WV. Additionally Xinergy owns or controls an array of properties in planned stages of development for orderly future production expansions. Founded in 2008, Xinergy was taken public on the Toronto Stock Exchange in 2009. The assets of the Company are generally located in the Central Xinergy State-of-the-art Wash Appalachian region of the Eastern United States. On March 31, 2014, the Company completed a private placement of 11.0 million common shares for total proceeds of $4.95 million. These funds will be used for general corporate purposes. On March 6, 2014, the Company appointed Joseph Groia to the Board of Directors. With this appointment, the Board now has five members, including three independent members. In January 2014, we completed construction of a $9.5 million coal preparation plant at our Raven Crest Mining, LLC (“Raven Crest”) facility. The Company also resumed production from the Raven Crest surface and highwall miner operations and began shipping coal from the newly constructed preparation plant. This coal processing facility allows the Company to increase the marketability of this low cost, high quality thermal coal to thermal markets in the eastern US and Europe. In January 2014, the Company began shipping coal from its South Fork Coal Company, LLC (“South Fork”) mid-volatility metallurgical mine on a one year 60,000 ton coal supply agreement that is expected to generate $8.7 million in revenues for 2014. Additional production currently is sold into the spot market while we continue to negotiate term contracts with end users throughout North and South America and Europe as well as international commodity brokers. The Company continues to evaluate possible sales of non-strategic, surplus and non-core assets in addition to other transactions in efforts to strengthen our balance sheet and improve liquidity in the near term. South Fork: 25,000,000 recoverable mid-vol. reserves. Coal quality is 26 vol, 4.5 ash, .94 sulfur and 14,500 BTU. The South Fork wash plant load-out site is connected to the CSX railroad. Raven Crest : 44,000,000 recoverable reserves. Coal quality is 12,300 BTU, 10 ash and 1.25 sulfur. The Raven Crest wash plant load-out site is also connected to the CSX railroad. Xinergy is expanding production at both South Fork and Raven Crest. Thermal production at Raven Crest for 2014 is projected to be 640,000 annual tons. South Fork mid-vol. metallurgical coal production is projected to be 500,000 – 600,000 annual tons. 2015 guidance is expected to be 709,000 on Raven Crest and 850,000 at South Fork. Since Xinergy management is “streamlined” without bureaucratic overhead, there is confidence that the company can be free cash flow positive with a more lucrative balance sheet in very short order. Additionally, based in part on their freight advantage, Xinergy enjoys optimum flexibility to take advantage of geographic variances in commodity pricing. This flexibility could dramatically enhance upside potential for current shareholders as commodity prices appreciate. Last year the United States was a major exporter to Asia and the UK on both the thermal and metallurgical front. Since current oversupply is being adjusted in the metallurgical market expeditiously, the low cost producers will start depleting market share from Xinergy’s South Fork Coal Seam the high cost producers. Xinergy has a significant “first mover” advantage on demand upswings because of its streamlined flexibility. The Company has one current annual met contract with the balance of production going into the spot market. Since Xinergy is not being hedged, a $20 increase in met pricing equates to an additional $10,000,000 in EBITDA in 2014 and close to $17,000,000 in 2015. The potential EBITDA gains from higher pricing will go straight to the bottom line. Thermal pricing on the AP12 international market has been hampered by oversupply from Australia and other countries, but that is not the case in the U.S. Currently, the U.S. is near a ten year low in inventory. Due to the current LT domestic pricing for thermal coal is hovering around $70. It is important to note that Xinergy is not being hedged; every $10 increase in pricing equates to an additional $6,000,000 in 2104 and near $7.4 million in 2015 EBITDA. Current macro views of the industry are increasingly positive, indicating a market turn. Assessing companies such as Xinergy with low cost production, balance sheet optionality and strong growth potential in the industry are key when investing in this sector. Taking into account the highlights of Xinergy and the industry combined with The Company’s recent trend, evidenced by the mid-March price of $0.42, we confidently recommend a “buy”. Copyright © 2014 Mike King And Princeton Research, Inc. ALL RIGHTS RESERVED. Reproduction or distribution of any or all material in this what stocks to buy mining stock news research report are strictly prohibited without expressed written consent. All content, images and material on this site is protected by International copyright laws. Prepared by Gina La Cavera, Mike King of Princeton Research Inc. www.PrincetonResearch.com. Rule 17B: requires disclosure of monies paid for investor relations. Princeton Research is paid $2500 for this report. This newsletter may contain certain forward-looking statements within the meaning of Section 27A of the Securities Act of 1933, as amended, and Section 21E of the Securities Exchange Act of 1934, as amended, including, but not limited to, statements as to future operating results and plans that involve risks and uncertainties. We use words such as “expects”, “anticipates”, “believes”, “estimates”, the negative of these terms and similar expressions to identify forward looking statements. Such forward-looking statements involve known and unknown risks, uncertainties and other factors which may cause the actual results, performance or achievements of the Company to differ materially from any future results, performance or achievements expressed or implied by those projected in the forward-looking statements for any reason.